Do no harm. Medicine’s first principle is absolutely put to the test during the new product development and innovation cycle for “high-risk” medical devices such as implants. While research and product development teams want to investigate and prove out every concept and potential outcome, they need to reduce the chance of unanticipated negative effects. What does that mean for animal studies and human clinical trials? Computational Modeling and Simulation (CM&S) lets you create and simulate human biologic test environments and conditions to complement the validation of safety and effectiveness by nonphysical means—not to mention accelerate development and lower cost. This not only reduces the risk of physical testing and speeds getting products to patients—CM&S can go beyond what is possible to explore within traditional end-product tests. In its virtual environments, you can define and model any patient condition to gather data to improve upon product design, performance, and patient safety. Testing on animals and humans is limited by the practical consideration of trying to replicate the conditions within an animal or human body. Often, even when these conditions are replicable, testing raises ethical considerations that must be adhered to in order to not expose the patient to harm. 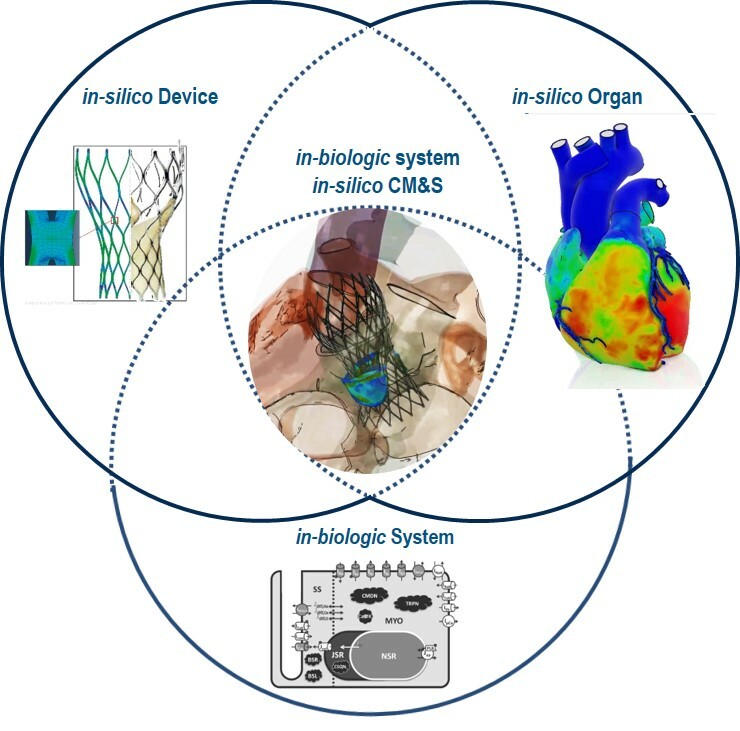 The state of the science is now “in-biologic system in-silico CM&S” (see Figure 1)—a “virtually real” capability that lets life science companies create biological models of how devices will operate within a living patient. For example, modeling an artificial heart valve—within a multi-dimensional, physiologically accurate “living” human heart computer modelof a specific person—lets you test valve performance in many conditions that are not otherwise possible to replicate or instrument. Typically, it’s not possible during in-vivo tests to measure tissue stress and strain, the flow and turbulence of the blood, the interaction of blood with the device, and granular details of the resultant valve motion and performance. This is all possible with in-biologic system in-silico CM&S, and represents a huge advance in the ability to deliver innovative products with improved patient safety. Since an implant ought to be “for life,” CM&S can also be used to simulate performance over long periods of time and under various conditions, and to model long-term drug interactions on the implanted materials. CM&S also addresses the increasing complexity of medical device systems. Nowadays, these can contain interrelated mechanical, chemical, biological, electrical, electronic, software, fluid, and other subsystems—each of which might include multiple assemblies of parts, and the whole of which must operate effectively and safely within the human organism. CM&S has the compute power and scope to handle these massive system engineering simulations and computations, running on a digital, collaborative innovation platform so enterprise and ecosystem stakeholders can view, explore, and utilize the virtual prototype model for different purposes and perspectives. The U.S. Food and Drug Administration has taken note—digital evidence is already being used at the FDA Center for Devices and Radiological Health (CDRH) to support regulatory submissions. For more on this subject download the free e-book, Why Modeling & Simulation Make Sense in the Medical Device Industry here. This post originally appeared in the Navigate the Future blog and is authored by Arieh Halpern.